Welcome to the world of Dexter Morgan, serial killer with a conscience. Dexter is a blood spatter analyst for the Miami Police Department, adopted brother of a homicide detective Debra Morgan, boyfriend of Rita and an all around good guy. He’s also a ruthless killer who takes out the trash, targeting murderers who slip through the criminal justice system. Trained by his adoptive father, Harry, a police officer himself, Dexter follows a strict code that both protects him and the innocent from his bloody justice. The first season of Dexter introduces us to the main cast: Dexter is our narrator, Debra is his emotional, foul mouthed sister, Rita is his loving but damaged girlfriend, Doakes is the antagonistic homicide detective that can sense something is wrong with Dexter, Angel is the detective that’s got Dexter’s back, and Misuka is the forensics tech horndog partner. The story of the first year of Dexter revolves around the Ice Truck Killer, a serial murderer who chops up prostitutes and leaves them neatly wrapped and packaged for the police. 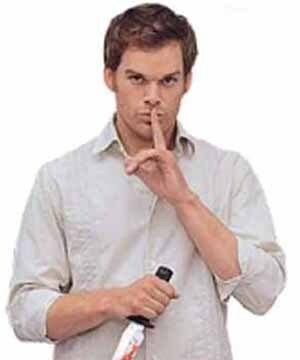 Dexter soon discovers that the killer knows about his dark side and is playing with him, leaving clues that not only lead to his identity, but to Dexter’s own repressed past. The show is both a psychological and crime drama, mixing elements of CSI, NCIS and other procedural shows with an almost “American Psycho” style of personal narration from Dexter. From the very beginning we’re put behind Dexter’s eyes, living the story through him, and it’s incredibly effective at pulling in a viewer and keeping them entertained. The show can be funny, a dark comedy over a few dead bodies, and the characters are spot on. Only Debra comes across as a bit flaky this first season, but I believe that was intentional as she works her way from Vice into Homicide and grows as a character over the course of the season. The first season is based more or less on the first Dexter novel by Jeff Lindsay, Darkly Dreaming Dexter. It takes liberties and the story ends quite differently, but it stands very well on its own, and the changes made to fit the story into a television format compromise none of the visceral nature of the novel. The show is a real treasure for those who enjoy dark comedy, crime dramas, serial killers and horror in general. Seeing a story unfold from the “monster’s” point of view is refreshing, and in the end you root for Dexter – you empathize with and actively cheer for a serial killer. He is, in his own way, a hero, albeit one who works on a different morality than the rest of us. One quick note about the opening credits and theme music. The opening is possibly one of the best in television history, the song a quirky, almost Twin Peaks-esq tune that highlights the strange nature of the titular character. All you need to know about Dexter is contained within the opening, which merely follows him through his daily morning routine. And yet, while shaving, flossing, cooking breakfast and making coffee, you sense something sinister, and you can see how simple things may not be so simple after all. I highly recommend seeing this series; Season 1 is a wonderful blend of weird and scary, and it will endear you to a killer with a heart of gold.